Ellie Soutter, one of Britain's most talented young snowboarders, died on her 18th birthday on Wednesday. Soutter won a bronze medal for Great Britain at the 2017 Youth Olympic Winter Festival and carried the British flag at the closing ceremony. 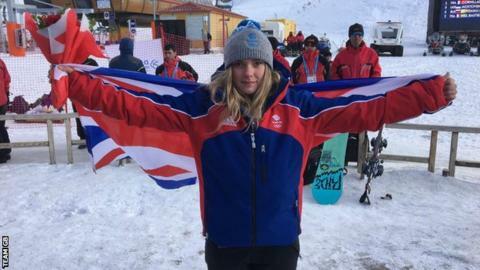 This month she was named in the senior GB squad for the snowboard cross Europa Cup circuit, and was tipped for a place at the 2022 Winter Olympics. She had been training abroad in Europe, and died near her home in France. No further details have been released about her death. Writing on Facebook on Thursday, her father, Tony Soutter, said he was "so proud of the beautiful young woman she had turned into". He added: "This cruel world took my soul mate and 'Bessie' from me yesterday on her 18th birthday. Ellie I will miss you more than you could have ever imagined. Rest in peace you little champion." British Olympic Association chair Hugh Robertson and BOA Athlete Commission chair Ben Hawes said in a joint statement: "Ellie was an incredibly popular and well-liked member of the team. The statement said Soutter was due to return to competition next month after being selected for the GB team for the Junior World Championships in New Zealand. "Ellie was one of the country's best up-and-coming snowboarders, competing in both snowboard cross and freeride," British Ski and Snowboard said in a statement. Team GB said Soutter grew up in Oxted, Surrey, before moving to the Alps, where she trained. Eight-time British ski-cross champion Emily Sarsfield is among those to have paid tribute. "So sad to hear the news of the passing of Ellie Souter. You really were an amazing girl," she posted on social media. "Such a fun team-mate, made me smile every day, cracking all the jokes and enjoying life to its fullest. I'm going to miss you and your amazing energy. All my thoughts to your family." Britain's 2010 Olympic skeleton champion Amy Williams said: "Such sad tragic news to wake up to. Thoughts and prayers go to Ellie Soutter's family." Slopestyle snowboarder Aimee Fuller said it was "devastating news" and added: "We've lost a fellow snowboarder and a great inspirational talent within our small community." Soutter's bronze was Team GB's only medal at the Youth Olympic Winter Festival in Turkey last year. Team GB celebrated her medal with the Twitter message: "Tears of joy and snow stuffed down her back." Her father had set up an online crowdfunding campaign to help her achieve this aim, which had raised close to a quarter of its 20,000 euros (£17,800) target.